This still frame, taken from a video by passerby Pierre Chiasson, shows the broken Grand Etang wind turbine. The nearby telephone poles give some indication of the size of the tower that stood 50 metres tall before it broke on Wednesday during high winds in the Cheticamp area of Cape Breton Island. 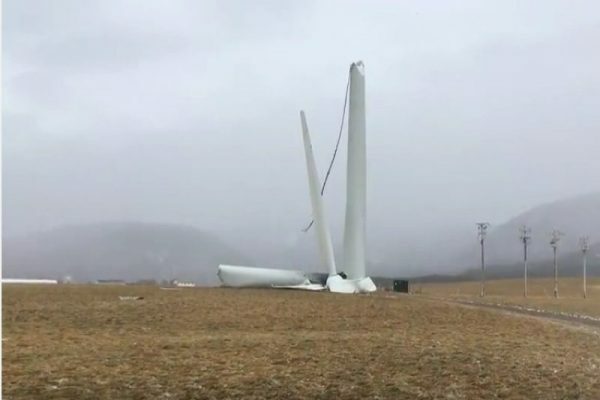 One of Nova Scotia’s oldest wind turbines has been knocked out of commission after strong winds lashed the north west coast of Cape Breton on Wednesday. The main tower of the Grand Etang turbine, owned and operated by Nova Scotia Power, snapped in two after being pounded by strong southeast winds, better known by their Acadian name of “les suêtes”, that regularly hammer the Cheticamp area with gusts of up to 200 km/h. Several locals, including area resident Pierre Chiasson, captured images of the fallen turbine after it had already succumbed to the high winds. “You can see what the wind can down here,” said Chiasson, as he added some commentary to the 29-second video he uploaded to YouTube. Chiasson said he was driving through the area when he started to notice some debris blowing near the road before he came upon the fallen structure at around 1 p.m. on Wednesday. “I’m not sure exactly how high the winds were, but I think they were close to 200 km/h,” said the lifelong area resident, adding that he also saw other items, including a baby barn, blowing around. Following the collapse that left the blades and upper part of the tower in a crumpled heap on the ground, Nova Scotia Power sent personnel to Grand Etang to investigate the incident. In a written release, the utility company said no one was on site when the Danish-built Vestas 660-kW turbine collapsed. The 50-metre tall structure, built in 2002, was one of the first wind installations erected in Nova Scotia and is the only one of its kind left in the province. A NSP spokesperson said it was too soon to speculate as to the cause of the collapse as investigators only arrived on the scene late Wednesday afternoon. There are about 220 wind turbines at 30 locations across the province. Wind accounts for about 14 per cent of the electricity on the Nova Scotia grid.